It has now been one year. Let that sink in. An entire year of living in a camper. A whole year with three kids... in a camper. A year of memories. A year of adventures. A year of mishaps. I figured it would be fitting to start the blog off with my notes about our first trip. For our first trip we decided to go to Troy, Alabama to see Kate’s Grandmother. We figured it would be a nice short trip to try things out as we set off on our adventure. We found a nice campground called Deer Run RV Park. (www.deerrunrvpark.com) It was about a 4 hour drive. Should be easy. I try to pull in the slides and they don’t work. None of them. I research a little and it looks like we have a dead battery in the RV. I decided to muscle through and try putting our battery charger on it and see if that would make the slides work. Bingo! The charger did the trick and the slides work. Next up is disconnecting all the hoses. I thought I was being smart by just keeping the gray tanks open so I wouldn’t have to keep draining them when we took long showers. I was not smart. It could be useful to do that, but I needed a full gray tank when I emptied the black tanks so I would have some soapy water to rinse out the sewage. I realized this when I went to disconnect the hoses and got hit with the smell of raw sewage. Out comes our garden hose to rinse out the sewage lines. No big deal. Except the hose sprayed some of the sewage out on me. Yuck. Can’t get any worse right. Everything hooked up and time to pull out the wheel chocks and hit the road. They are stuck. I mean really really stuck. I had this happen before with the little plastic wedge chocks. That is why I upgraded to the x shaped metal ones that just squeeze between the tires. Looks like when I filled all the tires I didn’t realize that the tires would squeeze into the chocks even harder. I ended up having to use a wrench as a breaker bar to unscrew the chocks tightening nut. Arggggg. While all my drama was going on Kate did an awesome job of getting the inside of the trailer prepped for travel day. She cleared all the counters and got everything secured. Then she sent the kids off to the playground to keep them from being under foot while we were tearing down. They met another kid at the playground and made friends. It looked like they could have played all day. Dalton told us later that the little boy was sad because his aunt died. He was really concerned about his new friend and told us he said a prayer for him. Moments like that make me think I may be parenting right after all. Such a sweet kid. Sophia spent the trip playing hangman with Kate and making a comic about the trip. It was cute, she showed what each of us was doing during our day. She drew me screaming "Work! Why won’t you work!" I think she nailed it. Driving turned out to be no big deal. We had mapped out or route and researched all the turns, so I knew what to expect for the whole drive. The truck did amazing and handled beautifully. 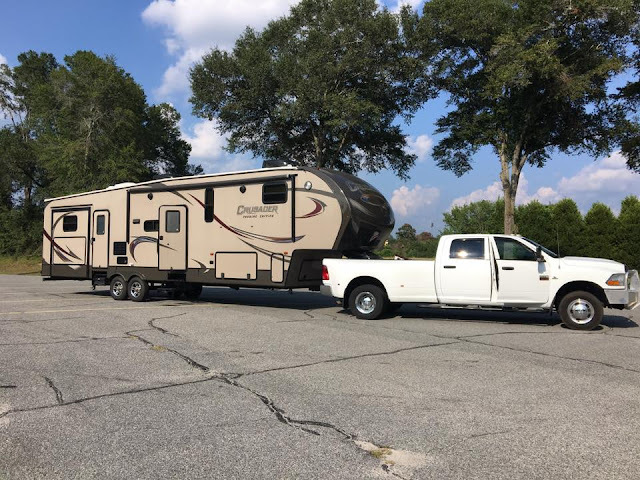 One of the coolest things about driving with a fifth wheel is that when you need a bathroom break you just pull over and hop in the trailer. Next time it would help if we had some water in the holding tank so we can flush the toilets. But overall it is fantastic. It is a bizarre feeling to drive along and no matter where you are you are home. Kinda cool. We ended up getting to the campground a little late, but Kate called ahead so it was not a big deal. Beautiful place. We start setting up and everything is going smoothly. I parked a little too far from the drain. The camper needs to move back. Too tired to do that, I decided to put it off until the tanks are full, no big deal. Then we start to pull out the slides and the slide in the kids room caught a cabinet door that got knocked open on the drive and ripped the door off the wall and messed up some trim on the slide. Whoops. I am going to have to be more careful in the future.